This book highlights recent findings on and analyses conducted on signals and images in the area of medicine. The experimental investigations involve a variety of signals and images and their methodologies range from very basic to sophisticated methods. 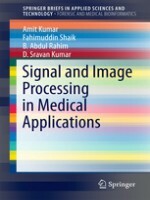 The book explains how signal and image processing methods can be used to detect and forecast abnormalities in an easy-to-follow manner, offering a valuable resource for researchers, engineers, physicians and bioinformatics researchers alike.